As a little boy there was a song I loved to sing. I learned it from my mother. She taught it to me and I sang it, and all my life it has replayed inside my mind. It seemed a pretty grand thing, to have Jesus living in your heart. And we always felt sorry for the poor non-Christians, those people who went about like walking ghost towns, their interior houses empty and abandoned. Our most fervent wish was that they too might one day invite Jesus into their hearts, that they too might one day be able to run the royal insignia up the flagpole. I suppose it's good to learn that sort of thing when you're still a child, before you get too disillusioned about the capacities of your own (or anybody else's) heart. It never occurred to me to doubt that my heart was spacious enough to accommodate a person like Jesus, or that it was the kind of place a person like that would want to live. When I invited Jesus, rather generously, to come into the house of my heart, it never occurred to me that he might take one look inside and say, "Sorry, this isn't quite what I had in mind. Do you have anything with an extra bedroom? And a view?" Nor did it occur to me that he might want to buy the house (like so many people in my neighbourhood in Sydney) only in order to demolish or renovate – that he might show up on the first day with trucks, sledgehammers, men in hardhats; that he might be the kind of homeowner who tears out the kitchen sink and knocks down walls. That's the way some of the great patristic writers spoke about Jesus. They described the heart as a house for Jesus – but a house in dire need of rebuilding and repair. To start with, it's far too small. If Jesus is going to live here, there will have to be extensions. And it's all looking pretty rundown. The roof leaks. Mold is growing on the walls. The front door is hanging off its hinges. There are strange smells in the hallway. Weeds are growing up through the floorboards. 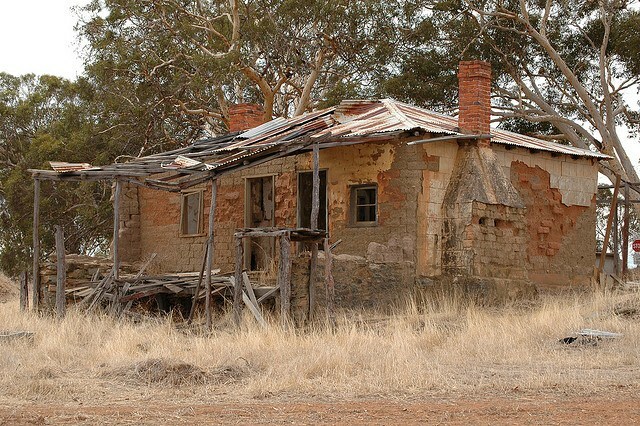 Jesus is moving into your heart not because these surroundings are fit for him, but because he enjoys the challenge of fixing up old places like this – a broken-down dump of a house. In the opening pages of his Confessions, Augustine poses the riddle of how an infinite God could be contained in any place. If God is the one who contains all things – if God is the environment in which all creatures live – then how could God be located within any of those creatures? What part of creation could possibly contain God? The very thought of it is absurd, like trying to grasp the horizon in your hand, like trying to pour the ocean into a teacup. "To what place can I invite you, then, since I am in you? Or where could you come from, in order to come into me?" (Confessions, 1.2.2). Yet God loves the human heart and wants to dwell there. Augustine is deeply moved by this thought, that God would choose to take up lodgings in such a humble dwelling. But there's a problem. God arrives, suitcase in hand, and knocks on the door of our heart. And he can hardly fit inside. The place is too small. And it's a mess, a ruin, a veritable pigsty. Yet God isn't deterred. God wants to live here: the place has a lot of promise; and besides, God likes the neighbourhood. So there's only one for it: God rolls up his sleeves and gets to work. As Augustine puts it: "The house of my soul is too small for you to enter: make it more spacious by your coming. It lies in ruins: rebuild it" (Confessions, 1.5.6). What Augustine is describing here is not what we would call a conversion experience. He's describing a process that will continue for the rest of his life. God renovates slowly, persistently, with boundless patience, and with loving attention to even the smallest details. My whole life will be nothing but the story of God's renovation. My whole life is one of God's repair projects. It's not the once-off experiences that matter – not any single episode of inviting Jesus into my heart. What matters is the process; what matters is that my heart gradually becomes bigger, wider, cleaner, more orderly. What matters is that it slowly becomes, over a whole lifetime, an inhabitable place for God. Two centuries before Augustine, Origen had also spoken of the gradual process by which our hearts become dwelling places for God. But if Augustine's language evokes scenes of a dilapidated Roman villa, Origen's language has about it a certain characteristic oriental, Jewish, Old Testament flavour: his themes are learning and feasting. For Origen, the heart is repaired and expanded by learning. As we learn more about God, gradually increasing our knowledge by daily increments, our hearts grow wider. At first the heart is too small, like (he says) the heart of a little child. But when it has grown big enough, Jesus is able to move in and take up residence there. And the goal of life, Origen thinks, is to become roomy for Jesus – to give Jesus room to move about easily and freely. As we grow, we are able to "offer such roomy hearts to the Word of God that he may even be said to walk about in them, that is, in the open spaces of a fuller understanding and a wider knowledge" (Commentary on the Song of Songs, 2.8). To you and me, this vision – of God inhabiting the domain of our understanding – might seem rather dry, too cold and intellectual. But for Origen it is the highest mysticism. To be sure, the whole process involves thought, reflection, study of scripture: all this is the necessary work of renovating our shabby home. But once Jesus moves in, he is festive and full of cheer. He lays a feast, and the Father and the Spirit celebrate together at the table: "Blessed is that roomy soul [latitudo animae, in Rufinus' Latin translation], blessed the couches of her mind, where both the Father and the Son, surely together with the Holy Spirit, recline and sup and have their dwelling-place!" Moreover, when Jesus takes up residence in the house of the heart, he brings with him every good thing. "With what precious stores, think you, with what abundance are such Guests regaled?" The purpose of life, in Origen's view, is to grow through learning – not because learning is an end in itself, but because through learning the heart grows wider, and such a spacious life can be a home where Father, Son, and Holy Spirit recline together and share a feast. 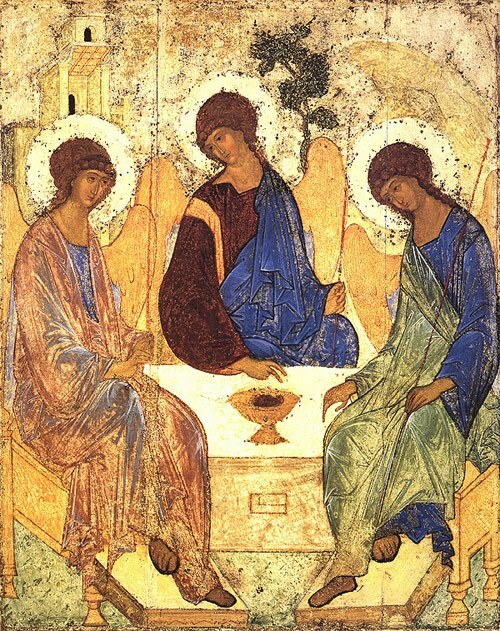 In Rublev's icon of the Trinity, it is usually said that we are invited to take up a seat, that the fourth place at the table is for us. But here is how Origen might see the icon: Jesus has laid a feast; the Father, Son, and Holy Spirit are reclining together at table; and the human heart is that table, the humble venue of eternal feasting, eternal joy.